Thanks to the talent and generosity of artist Gary Dausch, enthusiasts of racing history and fine art can acquire an incredible piece of artwork and support the Indianapolis Motor Speedway Museum at the same time. Dausch has created a beautiful rendering of Dan Gurney’s 1963 Lotus 29/1, depicting the legendary Californian Gurney sitting in the cockpit with car owner Colin Chapman and teammate Jim Clark at his side. Chapman is clearly deep in thought, listening to Clark’s analysis – all in the name of speed and the goal of winning. 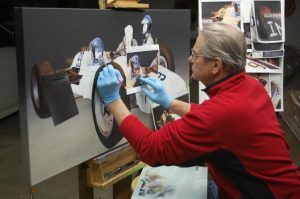 The Lotus 29/1 in Dausch’s oil-on-canvas original is the subject of the IMS Museum’s 2018 Restoration Project. Years after Gurney drove the 29/1 to a seventh-place finish at the 1963 Indianapolis 500, carrying a white/blue livery and No. 93, the Ford Motor Company painted the car “British racing green” and yellow with the No. 92 to honor Clark’s 1965 Indianapolis 500 win. Ford donated the 29/1 to the IMS Museum in 1973. The Museum is preparing to restore it to its beautiful white and blue No. 93 race livery and full running condition. If the artwork sells through the Museum, Dausch will donate 20 percent of the proceeds to the Lotus 29/1 restoration project, which requires a $90,000 price tag for an engine overhaul, new fuel cell, tires, suspension, body work and paint. The price of Dausch’s artwork is $4,800; limited-edition prints of this piece are also available for $150 each. An Indianapolis resident who spent years in art education and corporate communications, Dausch cites similar reasons why he joined Walker Racing’s IndyCar Series operation: team owner Derrick Walker’s vision, grit and pursuit of excellence without the deepest pockets in the sport. Dausch spent 13 years with Walker Racing in marketing. Today, he commits his time to restoring race cars in his home shop and producing auto racing fine art; his works hang in the homes and offices of many notable racing personalities. Dausch has enjoyed many years of friendship with staff at the IMS Museum, starting with longtime restoration manager, the late Bill Spoerle, who Dausch said was great friends with his father. He said it is that kinship and – of course – passion for the Lotus 29/1 that led him to support the 2018 IMS Museum Restoration P roject. Dausch came about his passion for artistry and motorsports honestly, as his great uncle was Erwin “Cannon Ball” Baker, who after a brief vaudeville career became world-famous for setting hundreds of records for coast-to-coast, or point-to-point, high-speed drives on motorcycles and stock automobiles. His name is the inspiration for later “Cannonball Run” cross-country races, which inspired a book and several movies. Baker won a race on the very first day of motorized competition at Indianapolis Motor Speedway – motorcycle racing on Aug. 14, 1909. He also finished 11th at the 1922 Indianapolis 500 in a Frontenac owned by the Chevrolet brothers, completing all 200 grueling laps without a relief driver. 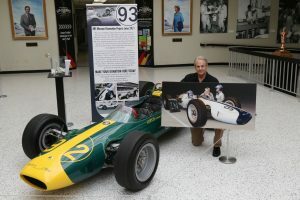 Dausch’s Lotus 29/1 painting is on display in the IMS Museum gallery, and available for viewing during regular hours and regular admission price. Supporters interested in purchasing the painting should contact Jennifer Hiatt, IMS Museum director of philanthropy and membership, at (317) 492-6563 for information. About the IMS Museum: The Indianapolis Motor Speedway Museum is home to one of the world’s premier motorsports and automobile collections, with interpretive emphasis on the Indianapolis 500-Mile Race and its role as an American icon of sporting tradition and innovation.